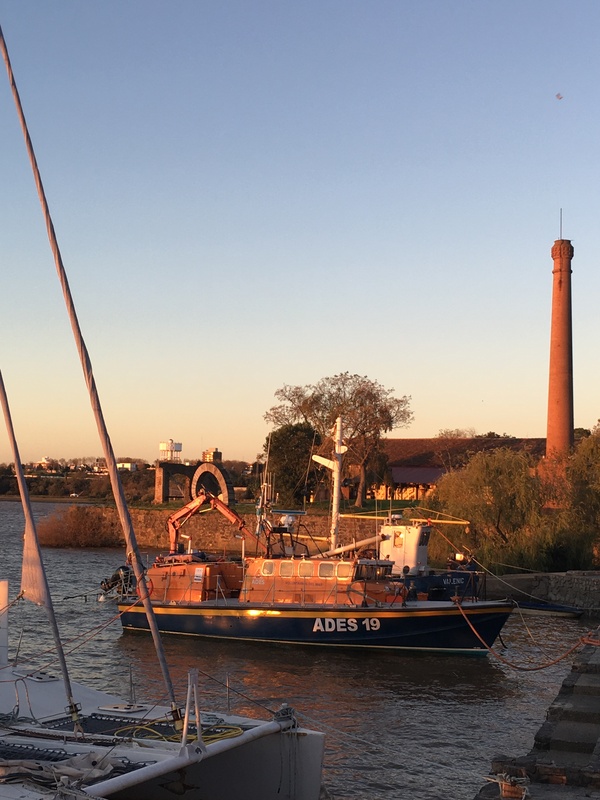 The ferry, a much smaller vessel than I’d expected, bobbed up and down as it cut across the Rio del Plata. 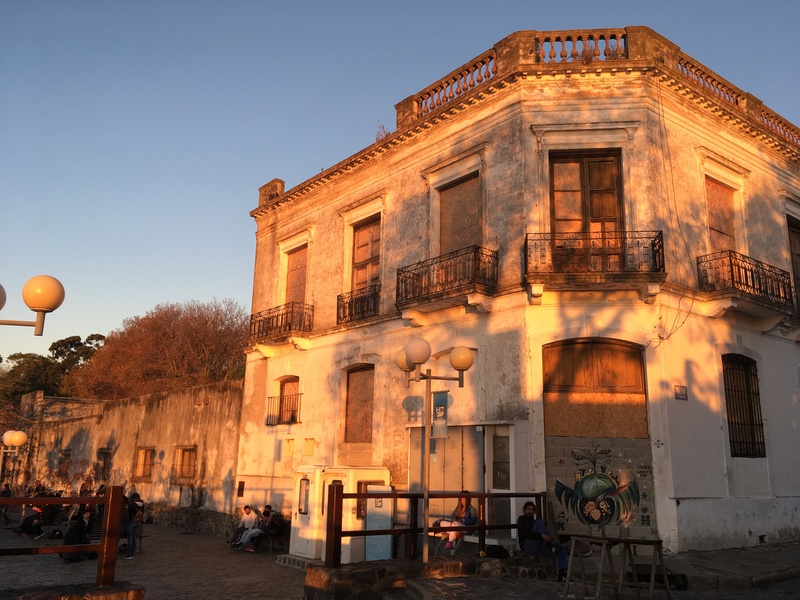 We were en route to Colonia del Sacramento – a quaint coastal town in Uruguay. 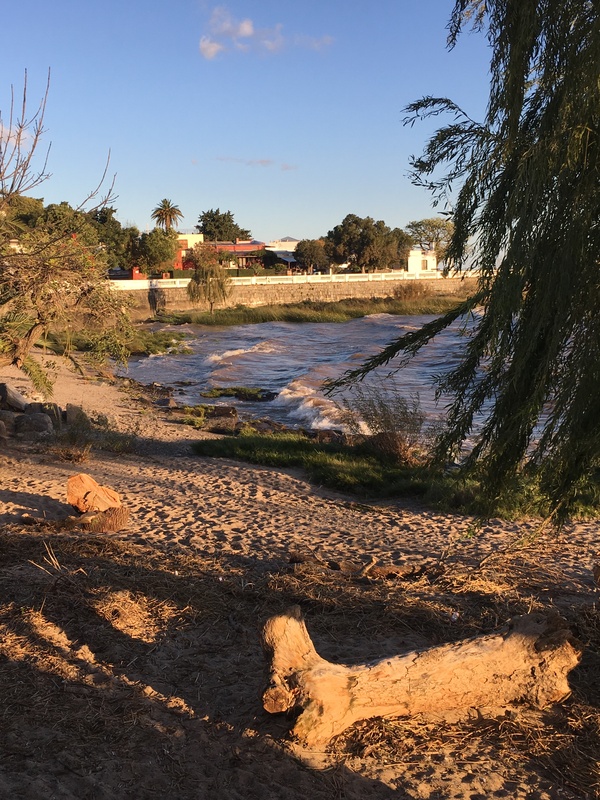 I was researching day trips from Buenos Aires when I realised just how easy it is to pop across the border into Uruguay. 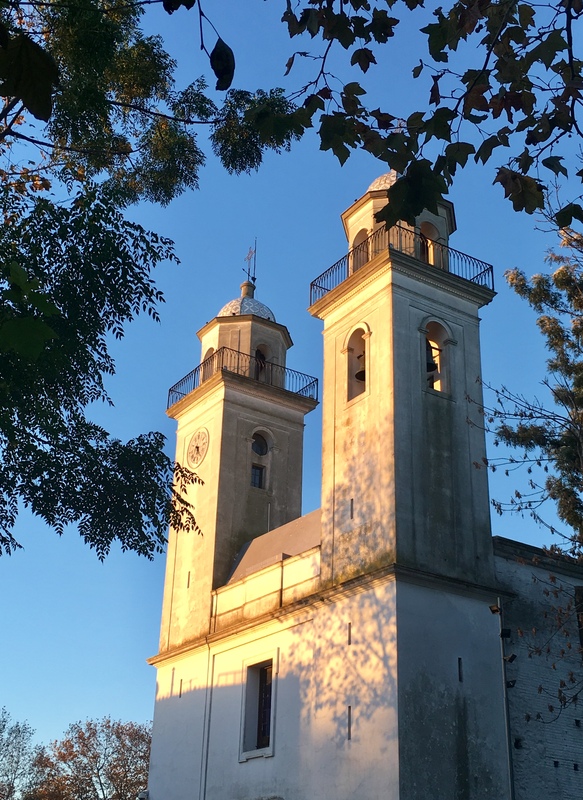 A mere 50kms from Buenos Aires, it appeared to be more popular amongst Argentinian day-trippers than Uruguayans themselves – a trend aided by a breezy 1-hour ferry ride, and an even smoother immigration process at the ferry terminal. It takes us longer to drive across Melbourne, and even longer still if we’re navigating Dhaka’s notorious traffic to get from Dhanmondi to Gulshan. There was no question about it, we were going to Uruguay. I’m rather embarrassed to admit my knowledge of the country was limited and didn’t extend far beyond the infamous story of the Uruguayan rugby team who had to resort to cannibalism after their flight crashed in the Andes (thanks Reader’s Digest). So, I embarked upon my journey with a purpose – to educate myself. Disembarking from the ferry, we lugged our backpacks through streets devoid of life and over cobble-stones that wreaked havoc on my son’s stroller. 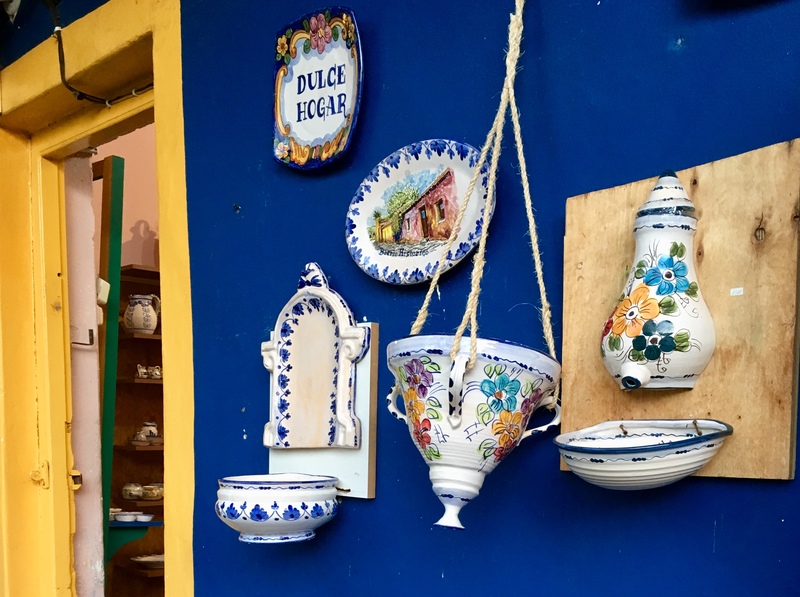 We passed money changers, tacky souvenir shops and restaurants that screamed tourist traps and entered our shockingly overpriced and woefully underwhelming hotel. If I leaned out far enough and scanned the horizon beyond the drab buildings and nondescript parking lot, I could just about manage to catch a glimpse of the River Plate, its waters brown and boring. It wasn’t looking very promising. We made our way towards the beaches via the wide avenues of Rambla de las Americas, and as we’d suspected, there wasn’t a soul in sight. Not quite the heaving weekend getaway that I’d been promised, but I blame that on the frigid weather, so anomalous with beach towns. The seclusion however, felt very liberating as we scurried across the sand, chucking rocks in the water and giggling – our very own private romp on the beach. A largely uneventful stroll through Colonia’s suburbs took us to a wooded area. The map had indicated a playground at the site and as my two-year old is on his own personal quest to check out playgrounds in every town, we found ourselves staring at a handful of rusty, forlorn-looking slides and see-saws. What I viewed as derelict, my son took to with glee, rushing to climb up the steps to the slide. And it was only as he struggled to heave himself up the rungs that I realised the impossible angle at which the slide was built, the tunnel providing more of a free-falling experience than a zippy ride down a slope. My eyes then fell on the see-saw, suspended at a 45 degree angle; across from it, another set of ladders led to a colourfully painted bridge which ended abruptly over a 10 foot drop. Clearly not a stickler for health and safety. We did however find a slightly more suitable, but equally dirty playground closer to our hotel. 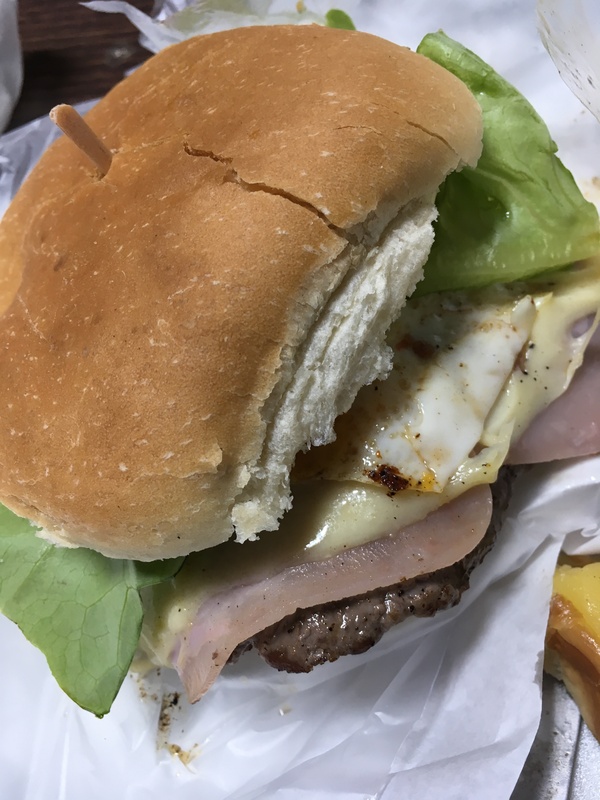 But what was more exciting about this discovery was the little food truck that was parked alongside it selling chivito – the Uruguayan national sandwich. Sensing I was new to what is clearly Uruguay’s quintessential food, the lady behind the counter took me under her wing and crafted a mountainous sandwich of strips of steak, cheese, tomatoes, fried eggs, relish and slathered in her “secret” sauce. I was full after two very messy, but very delightful bites. 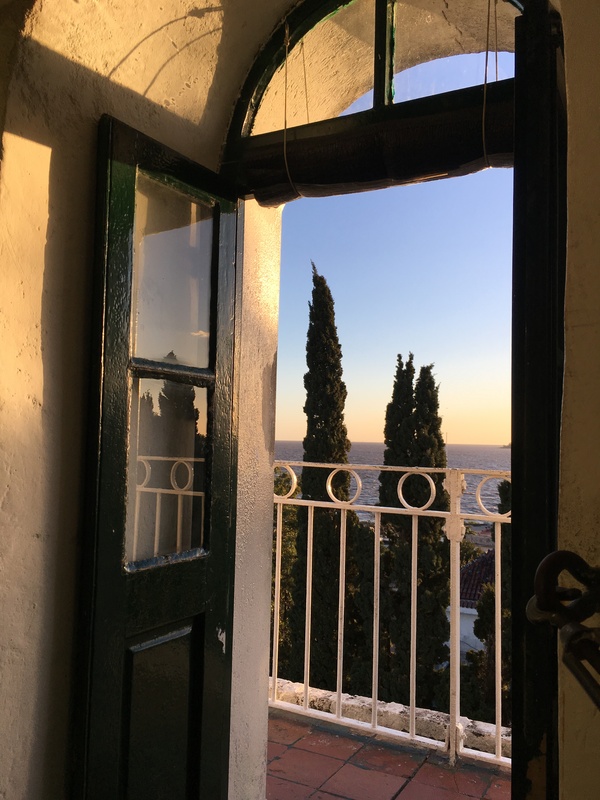 As the afternoon wore on, I left my napping son with my husband who was now second guessing our decision to visit the town and set off to explore. Given my notoriously bad sense of direction, I was slightly nervous about venturing out without a map, but I made for what I assumed was the direction of the Barrio Historico or old quarter, now a designated UNESCO World Heritage Site. The streets were mostly quiet, other than for a handful of tourists bumping over the stones in their little golf-carts. I scampered across the windswept promenade, pausing briefly to take in the vast expanse of choppy, murky waters slapping ferociously against the reeds on the riverbank. Out of the corner of my eye, I spied the lighthouse and made my way towards it. I realised it was parallel to Avenida General Flores, the street I’d just walked down from where my hotel was. Guess I didn’t need that map after all – there’s only one main thoroughfare in this part of town! 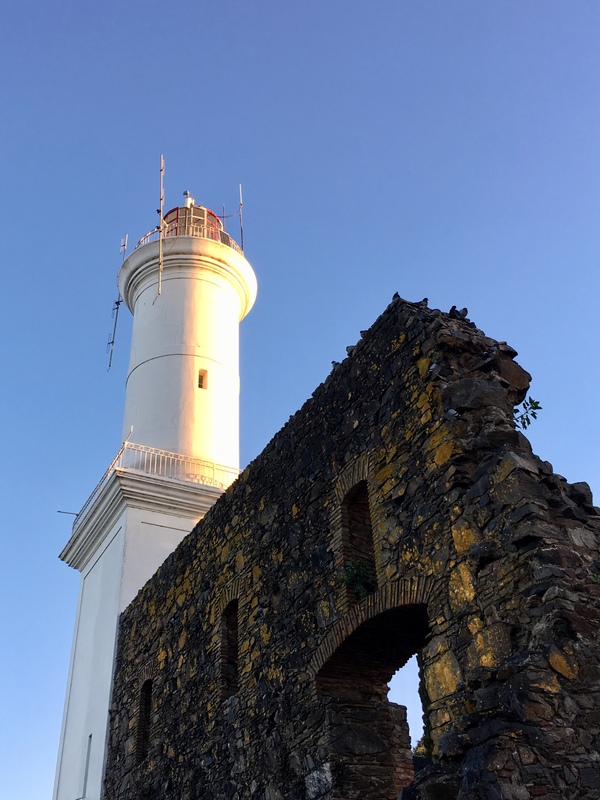 The Faro, Colonia’s 19th century lighthouse, is apparently still functioning. Its red and white tower rose over what initially appeared to be a pile of rubble. I soon learnt these were the ruins of a 17th century convent, the Convento de San Francisco. 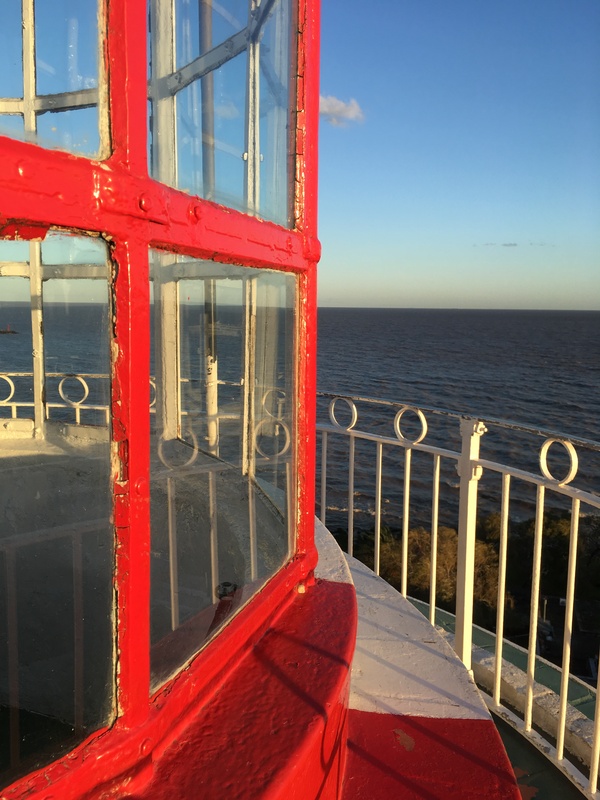 I approached two men seated at a table plonked unceremoniously at the base of the lighthouse. A rickety sign read, “Tickets: 50 Uruguayan Pesos” – about 1.5USD. As I rummaged in my purse for change, the men, deep in what I assumed was riveting conversation, simply waved me in. No sooner had I stepped in that I found myself scaling the seemingly endless spiral steps. I emerged onto the tiniest platform with sweeping views over the river. My presence seemed to thoroughly excite a group of girls lounging on the rails. One of them handed me a phone and then proceeded to strike up a procession of increasingly elaborate poses. While I had little inclination to continue as their personal photographer, I had to admit the lighting was stunning. The sun was low on the horizon, on the brink of setting and had cast a subdued orange glow on all in its path. The Rio del Plata, which had moments before been muddy and unwelcoming, now shimmered in the reflected light. It was spectacular.